Following the devastating raids on Pearl Harbor on 7 December 1941, lightning advances by Japanese forces throughout the Pacific and the Far East, and a desperate battle by the Allied command in the Dutch East Indies, it became evident that an attack on Australia was more a matter of `when’ and not `if’. On 19 February, just eleven weeks after the attacks on Pearl Harbor and two weeks after the fall of Singapore, the same Japanese battle group that had attacked Hawaii was ordered to attack the ill-prepared and under-defended Australian port of Darwin. 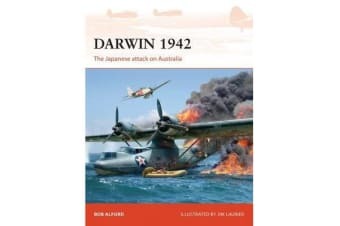 Publishing 75 years after this little-known yet devastating attack, this fully illustrated study details what happened on that dramatic day in 1942 with the help of contemporary photographs, maps, and profiles of the commanders and machines involved in the assault.